Ouch! Wonder who will step in , having seen the loads? Jet Airways has been forced to ground planes due to its financial woes. It has more than 100 aircraft in its fleet, and flies on 600 domestic and 380 international routes. One out one in - don’t think it’s been reported previously that Pegasus have 5x weekly to Istanbul-SAW on sale, starting from 1st July. IIRC they’ve only been mentioned in terms of slots applied for on this route thus far. Virgin? When they get their planes back. Also - just an observation: aren't Etihad lousy at picking airline partners? NZ code-share on VS MAN-LAX this summer. I can never work out if a code-share is intended to be a prelude to a service. Now that would be excellent! Hello - does anyone know when the multi story carpark will be out of use as they begin taking it down? I usually spend a little time there when I drop friends and family off at the airport, so would be great to know how long is left for it. Many thanks in advance. I spoke to airport staff who are involved in the MANTP project and they are not aware, as far as they would say, that there are any plans at present to demolish Terminal 1 multi-storey. That would make sense since everything beyond T2X and Piers 2 & 3 is just in the proposed stage. However, if T1 is demolished the multi-storey will have to come down too. It’s likely for sure, but not a given as the car park is a separate structure that over the years has acquired various ramps etc connecting it to the terminal. As such with some work it could be retained even if the terminal was flattened. However whether that would be deemed cost effective compared to levelling the whole area would depend partly on what the airport eventually decides to do with the current T1 footprint. The original question by ManchesterUK was with regards to whether the multi-storey car park was to be demolished in the near future and I believe that we agree that that will not happen in the near future. Imagine the problems with regard to gaining terminal access whilst any demolition was taking place! Now we have the secondary question of "if and when" Terminal 1 may be either totally revamped or, preferably, removed. 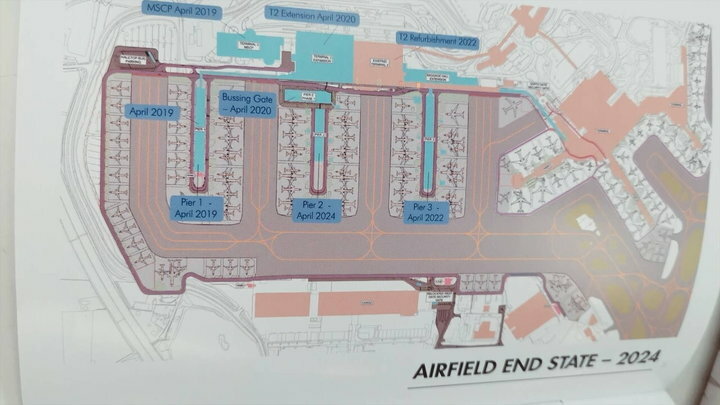 Whilst we understand that the airport's Master plan does not provide for the terminal being retained in the long-term, I suspect if will still be around for maybe as long as the next 10 years. The cargo sheds need relocating south side to free up termianl space along with the fuel farm it may be a bit expensive but in the long run it would be worth it. As well it should be noted that whilst the new pier does look very nice from the inside although its blatently obvious where corners have been cut and that no real technological innovations have been used. The outside is dissapointing, this is a once in a generation project and the extra money should of been spent on the asthetics of the terminal. The outside is disappointing, this is a once in a generation project and the extra money should of been spent on the aesthetics of the terminal. I've been highlighting this from very early on in the build when it was becoming plainly obvious that they were cheapening the whole project. Unfortunately, the MAN fan boys seem ignorant to this and are quick to defend the disappointing build. When you consider the superb look of the T1 southern front, Terminal 2 and the BAMA terminal from the 1990s, this new bit certainly looks as though it was thrown up on the cheap. The new finger looks like part of Sellafield, a steelworks, IKEA, or even a young offenders centre. The grey colour is hardly pleasing on the eye. It’s likely for sure, but not a given as the car park is a separate structure that over the years has acquired various ramps etc connecting it to the terminal. T1 MSCP is a separate structure constructed in the early 70s and is joined to the original 1962 terminal by ramps etc. However the basic structure of a car park was modified before construction to contain what are now the T1 check in hall, baggage claim and arrivals hall within the structure. So the two buildings are inextricably interlinked. And for the reasons outlined by Chaps 1954, there is no chance of the cargo centre (or any other major development) going southside into Cheshire. The line of development to the west of the airport was set by the fuel farm construction first; this was adjacent to the old west side hangars. The FLS hangar and Cargo Centre came later in the only area at the time which could be developed easily in terms of planning permissions and cost. There were no Master Plans to speak of in those days. Last edited by Suzeman; 26th Mar 2019 at 19:41. That seems to suggest the remote parking west of the new Pier 1 will also open in April - unlikely as it is stil a landslide car park. It also seems to confirm my fears that the new layout won’t add any more capacity airside in terms of stands. If anything they could end up with less stand capacity at peak times than they have now?